I’ve lost count of the number of bikes I’ve owned over the years, but I’ve only owned one floor pump ever: the . This is not say that I’ve never used anything else, but that Silca has never needed replacement at home. I know that there are plenty of other pumps that can achieve 100psi in fewer strokes or that have heads that effortlessly switch from Presta to Schrader valves, but they all seem to crap out after a few years and then you can’t get replacement parts. By then, there will be an entirely new model promising to be better in every way to the former. Then you’ll be forced to chuck your old pump unceremoniously into the landfill. In contrast, the basic design of Silcas hasn’t changed in decades, and the replacement parts are widely available. I’ve replaced the rubber washer in the head about 5 times and I just recently replaced the leather gasket in the cylinder for the first time. That’s about 10 bucks total. Pumps from 30 years ago use the same pieces as new Silcas; I can’t think of another cycling accessory that does that. On the other hand, Silca pumps today are overpriced compared to the shiny legions of pumps coming out of Asia. The finish and craftsmanship have taken a hit too. Where there used to be cast metal pieces there is frequently plastic. 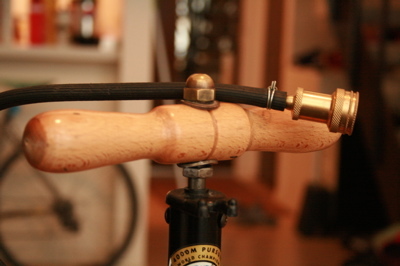 And if you ask about ergonomics…well, let me direct you to the pump’s classic lines. One thing I learned about tuning up my Silca is that when the pump gradually loses efficiency, either the leather gasket might have worn out or the cylinder might need to be regreased to aid in sealing. If the gasket is worn out, you’ll need to grease the new one well before you reassemble, and it’ll take a few days for the grease to soften the gasket well enough so it seals properly. Until then the efficiency will be poor but will eventually return to normal. Silca pumps are kinda like a old VW: not the most modern or easy to use, but simple and easily repairable. I got my pump in 1994, and I expect to have it for another 15 years as my only floor pump. Hell, I might get it repainted this year. Do you think you could say the same thing about your Blackburn, Topeak, or Zefal?